There are a number of compelling stories here in York County regarding the various Confederate units that passed through here during the Gettysburg Campaign. Jubal Early‘s Division, with the 17th Virginia Cavalry and the 35th Battalion Virginia Cavalry spent several days here in June (elements were here from June 27-30). A part of Albert Jenkins‘ cavalry brigade camped June 28 at Dillsburg in NW York County. On June 30 and July 1, J.E.B. Stuart‘s cavalry division passed through western York County trying to find Early and/or Ewell. Well over 1,000 horses were stolen from York County farmers during the week of Confederate incursions / occupancy. There were 686 separate farmers and townspeople who filed claims with the state auditor in a futile attempt to get recompensation after the war. Thousands of other farmers took their horses to Harrisburg or Carlisle across the Susquehanna River to safety or successfully hid the animals in remote woodlots, valleys, and mountains. Residents at times took elaborate steps to safeguard their horses and mules. One prosperous farmer hid his huge Conestoga draft horse in his elegant parlor next to an expensive rosewood piano. When the Louisiana Tigers came calling, he denied having such a horse. However, the neighing from his parlor betrayed the animal’s presence, and it was led away. The farmer was left with a fistful of worthless CSA currency and a parlor that smelled like a barnyard. People tightly tied string around their horses’ legs to make them appear lame (it rarely worked, as the Southern farm boys quickly recognized this trick). Other farmers led horses downstairs into old German-style vaulted stone cellars (the odor and noise often gave away the horses’ presence). Some hid horses under haystacks (that worked several times!). One old lady in Dover, Pa., sacrificed personal hygiene and decorum to save her favorite horse. She led him out to the barnyard and picked up handfuls of soft cow dung, which she plastered all over her horse. When Rebel patrols arrived, they took one look at the manure-coated horse, laughed, and rode on to the next farm. A group of New York shysters sold membership cards to the Knight of the Golden Circle to unwitting farmers, who paid a buck for the golden tickets and some secret hand signals that were supposed to protect their livestock and personal effects from danger should Confederates approach. Both Generals Stuart and Early commented in their official reports about how amusing and strange it was to see these gestures being flashed at them as they rode along. Some York County old-timers believe these New Yorkers were actually teaching the locals sign language used for the deaf, and legend is that they signed out phrases and words that were not commonly used in polite society. Issue # 15 of Charge! has been mailed to all members of the Johnny Reb War Gaming Society. This issue has some great articles written by a wide variety of wargamers. For those blog readers not familiar with Charge!, it is the hard copy quarterly newsletter of the society and comes free with paid annual dues. Each issue contains miniature wargaming scenarios suitable for regimental-level rules such as Johnny Reb 3, Regimental Fire & Fury, Dave Marks’ new Honor & Glory, Mr. Lincoln’s War, American BattleLines, Rally Round the Flag, and others. The newsletter also features terrain tips, painting guides, biographies, vignettes, wargaming after-action reports, book and new product reviews, articles on weaponry, and other items of interest to wargamers and Civil War buffs. * To the Sound of the Guns, by Robert Sweeney, Jr. – an overview of Johnny Reb 3 rules covering artillery. * Showdown at Seven Pines, by Mike Wedding – The southern half of the fighting at Seven Pines on May 31, 1862. * Sumner’s Fight at Fair Oaks, by Scott Mingus – The northern half of the fighting at Seven Pines on May 31, 1862. * Fair Oaks Heroics, by Russ Lockwood – Vignettes and anecdotes from the Battle of Fair Oaks / Seven Pines. * Minute Biography: Capt. Samuel Richardson, by Larry Reber – The first in a series by Larry of what will be dozens of life overviews for notable Civil War personalities, coupled with photos of Larry’s custom-converted 15mm figure of that person. Richardson was noted for his colorful jaguar-skin pants and his hard riding as a partisan. * Bronze Guns and Iron Men: Confederate Artillery of the Army of Northern Virginia. Part 1 – Limbers and Caissons, by Peter Griffith – an introductory article to the artillery of Lee’s army and a painting guide for wargamers. * Product Review: Wargamer’s Terrain FlexRiver, by Doug Rogers – a review of a new system of flexible latex rivers for the gaming table. * Minute Biography: General Isaac Trimble, by Larry Reber – #2 is this fascinating series, Larry presents a custom figure of Ike Trimble, the firebrand who clamored for an attack on Cemetery Hill during Day 1 at Gettysburg. * The Sutler’s Corner: ACW Accessories from Les Batiments, LLC, by Scott Mingus – A new line of 10-15mm accessories from George Nafziger and Hank Lubbers, including tents, stone walls, lob cabins, and other goodies. * Introducing the Element of Chance, by Robert Sweeney, Jr. – An exciting new twist for JR3 players, Bob introduces a card system to add randomness and fog of war to the JR3 game. Very fun! * Modifying the Charge Procedure in JR3, by Todd Shipley – some useful and interesting new modifications to P.J. O’Neill’s charge resolution tables for Johnny Reb 3. * Shades of Blue & Grey: A Painters’ Eye View. Part 1, by Andrew MacDonald-Rice – Andy Mac presents the first in a series of figure painting tips and guides. * Regimental Level ACW Scenario Books, by “the Mad Wargamer” – the veteran masked marvel brings JRGS members an overview and summary of commercially published wargaming scenario books for Civil War gamers and challenges the membership to submit scenarios for a wide variety of battles not yet covered or undercovered. Lots and lots of goodies coming up in the next issue. We continue to bring occasional articles from publish authors of Civil War books, with a new surprise guest writer coming in Issue #16! In the past, we have published articles from J. David Petruzzi (Plenty of Blame to Go Around: Jeb Stuart’s Controversial Ride to Gettysburg), Phil Cole (The Artillery at Gettysburg), Brent Nosworthy (Bloody Crucible of Courage), Scott Mingus (Flames Beyond Gettysburg: The Gordon Expedition), Chuck Teague (several magazine articles for national publications), nd others. We have several more ACW authors lined up as guest writers in future issues!! New Civil War markers being erected in PA! New historical markers are being placed in seven towns across south-central Pennsylvania this summer to commemorate events from the Civil War. Among these locations are Gettysburg, York, Hanover, and Wrightsville (all of which play a key role in my new book, Flames Beyond the Susquehanna: The Gordon Expedition. These markers are part of the state-sponsored Pennsylvania Civil War Trails program, similar in concept to well-regarded programs in Maryland and Virginia. One of the new markers honors the courage of Wrightsville’s residents, “Women and Children under Siege.” A number of residents came under Confederate artillery fire when John B. Gordon‘s expeditionary force attacked Union entrenchments surrounding the town. Most huddled in their homes and cellars, although a few caught unaware in the streets when the guns opened fire had to dodge shell fragments that rained down upon the town as the Union militia retreated towards the Susquehanna River. Mrs. Amanda Beaverson and her three children were hustled to safety in a cellar by a man named Jacob Freet, who spotted the mother and kids standing in the street and shells exploded overhead. A driving tour and literature will be available for those folks wishing to explore beyond Gettysburg to visit other spots in Pennsylvania relevant to the Gettysburg Campaign. Many of you are aware that I live near the Gettysburg National Military Park. Every now and then, I will post updates from happenings in the park and around the community. * Fencing has been installed in the past month or so around the Sherfy farm and orchard, essentially completing the restoration of the fencing in the Peach Orchard area east of Emmitsburg Road. Fencing to the west will come later. Some one lost control of a car and wiped out some of this new fencing already. * Work continues to haul away the cut down trees around the Slaughter Pen area and Devil’s Den. Rock formations that were hidden for years by trees and underbrush are now in view, and I noticed a number of people climbing on the rocks, enjoying the sunshine. Other cuts have recently occurred on Culp’s Hill. The majority of the cutting is finished for this season. * A number of cannons have been refurbished and returned to the battlefield, including several along the Wheatfield Road. I noticed that the ones on Little Round Top depicting Hazlett’s Battery are still undergoing restoration and are not present. Hazlett is buried in the same town where I was born – Zanesville, Ohio. I may write an article on him sometime downstream. * Recent flooding has eroded some of the ground along the Slaughter Pen area, including a piece of ground where a couple CSA bodies were photographed after the battle. * I have a new favorite place to relax after battlefield tramping – The Spot, on Baltimore Street near the square. Great coffee!! Seattle’s Best. Good selection of books, as well as goodies and snacks. * Best Chinese in town? I like Mayflowers, although others prefer Ping’s. Sure beat Pickett’s Buffet and McDonalds! * Sales of my Human Interest Stories of the Gettysburg Campaign have been quite good! I was able to sign quite a few copies last weekend during History Meets the Arts, and I know a few folks stopped off this week to pick up signed copies. I have a few autographed first edition copies left for sale. Contact me at scottmingus@yahoo.com if interested. * Work continues at the Daniel Lady Farm to clean it up – what a great addition to the local preservation efforts! Kudos! Who are the “best” Civil War miniature painters? In years of attending wargaming conventions in the Midwest when I was involved in HMGS-Great Lakes and more recently here in Pennsylvania and Maryland with HMGS-East, I have seen hundreds of painted armies – mostly average to very good, some poor, and a few spectacular. And, there has been the occasional unpainted or spray painted monochrome armies from gamers that had not yet had the time to finish their figures. I’ve seen guys (and the occasional girl) with carefully shadowed and highlighted paint job on their figures, and I came away impressed and challenged to bump up my own skills. In browsing the flea markets and dealer halls, I have also noted a wide variety of styles and qualities to their painted armies, even from “professional painters.” The same has been true of armies I have purchased from eBay or Bartertown. At times, I have been disappointed by these “pros” when I bought sight unseen from Internet sellers. Other times, the figures were much better than advertised. A few years ago, after eye surgery (detached retina followed by a cataract), I basically retired from painting 15mm figures. I invested some money obtained from selling older armies I had bought through the Internet in some premium painted 15mm figures from West Virginia painter Larry Reber, owner of Gettysburgsoldiers.com. I may be biased, but I have owned figures from dozens of painters, including some of the better known pros, and I think Larry’s work is simply the finest painted 15mm figures on the market today, especially his custom work. He’s terrific, and when I have his figures on the tabletop, folks take notice. My painting is OK; his is light years ahead. Recently, I started admiring Andy MacDonald-Rice’s work on the Internet through his photo gallery, and I think he’s one of the most talented painters I have seen for larger scale figures. He is writing a series for the Charge! hard copy newsletter on how to improve your painting. Watch for it! So, who do you consider to be the best commercial painters on the market today? Everyone has their favorite professional – who is yours and why? Several of you have asked me recently about the status of my long-awaited book on the “first” fighting at Gettysburg (the skirmishes of June 26) and the subsequent burning of the Columbia-Wrightsville bridge to prevent John B. Gordon‘s Georgia brigade from crossing the Susquehanna River. Flames Beyond Gettysburg: The Gordon Expedition has just finished the copy edit stage and has been submitted to the layout person to beging formatting the text and graphics for publication. I appreciate Eric Wittenberg, Mike Nugent, and J.D. Petruzzi, the forces behind Ironclad Publishing, for the opportunity to make this book Volume #5 of their Discovering Civil War America Series. David Wieck and David Schultz wrote the last volume, an excellent treatise entitled The Battle Between the Farm Lanes: Hancock Saves the Center. I am pleased to be next in line after this interesting work. We hope to have the Gordon book in print later this summer. It will be available on the Internet, as well as at leading bookstores and Civil War shops. A fair amount of material I left out of this book regarding Jubal Early‘s occupation of York, Pennsylvania, has been recrafted into an article accepted for publication by the Gettysburg Magazine. This is undergoing editorial review and editing, and should appear in an upcoming issue. I am also working on an article covering J.E.B. Stuart‘s wearisome ride from Hanover to Dillsburg, material touched upon in Eric and J.D.’s book, augmented by many new stories that have not appeared in print that I have recently found in some out of the way archives. This will also be submitted to Gettysburg Magazine. My goal is to present as much material as I can on the role of York County, my adopted home, in the Gettysburg Campaign. Other upcoming articles will focus on the U.S. Army Military Hospital in York and the part it played in the Gettysburg Campaign, as well as Hanover Junction. Anyone with original letters, diaries, journals, or other material concerning York County and the Gettysburg Campaign are encouraged to contact me at scottmingus@yahoo.com. Photo from the Library of Congress. It depicts the Northern Central Railway bridge over the Codorus Creek at Hanover Junction, Pennsylvania. This was rebuilt by Herman Haupt’s USMRR workers after being burned June 27, 1863, but cavalry accompanying the Gordon Expedition. I was among the group of a couple of dozen or so historical authors who appeared at various venues in Gettysburg on Friday and Saturday during the 10th annual History Meets the Arts. This was my first time as an author to attend this event, and I was very pleased to meet so many great people, including several of my blog readers. On Saturday, with the weather (at the time) being marvelous, HMTA Book Festival organizers moved a small group of authors from the Gettysburg Hotel outdoors to the grounds of the American Civil War Museum / Gettysburg Gift Center. One of these was fellow blogger Richard G. Williams. Rick shared some insightful and interesting ideas on print-on-demand publishing, as we have used a common printer in the past. During this morning’s private devotions, I reflected on how much better today’s world is than the world of 1863. In the same general area where Rick, a native of Virginia, and I, a native of Ohio, sat at opposing tables and calmly and peaceably engaged in stimulating conversation, two strangers sharing a common interest in the book industry, two armies were trying to kill one another on July 3. Specifically, Lt. Col. Franklin Sawyer’s 8th Ohio, some of whom were from the Cleveland / Lake County area where I used to live for two decades, was positioned near the Emmitsburg Road during Pickett’s Charge and blazed away at John Brockenbrough’s oncoming Virginians. The common interest between those Virginians and Buckeyes was the Minie ball. Nearly 144 years later, a Virginian and a Buckeye sat together near those killing fields and shared the bonds of mutual respect and a common interest of the pen, as well as our respective faith in the Lord. I could not help but reflect in my devotions this rainy Sunday morning but how we have come a long way since the tragic days of 1863, when perhaps Rick and I would have been shooting at one another, not laughing and talking. I also, as a Christian, could not help but recall how many stories I have read regarding each warring side’s fervent belief that their cause was blessed, and that God would bring triumph in the end. And yet, what the battle brought was a “new birth of freedom” for so many, and the tragic scars of war and hatred for so many others. In today’s world, we need to do whatever we can to honor the memory of those who gave their lives, their time, their individualism, and their duty to their causes, but we must NEVER repeat their mistakes of regional sectionalism and strife. And, we must continually strive to do our parts, as Civil War historians and history buffs, to help continue to heal the remaining wounds. May God bless America, and may Americans bless God! * Round Top Miniatures is working on a new line of Gettysburg 10mm houses. I have seen photos of the first prototype, and I am impressed! These will be a hit. Watch this blog, and the hard copy edition of CHARGE! for more information. The sculptor, John Mayer, makes some really, really nice custom Gettysburg houses for 25mm gaming. * A major add-on expansion of the Johnny Reb rules is in the works, adding rules for combined armes and naval gaming to the existing land-based rules. Tentatively titled “Jack Tar,” these will be out later in 2007 from the Johnny Reb Gaming Society. * Battlefield Terrain Concepts is now selling cast resin bases for model trees, the newest addition to their line of custom resin pieces. These debuted at Cold Wars and were a hit, selling out quickly. * Les Batiments is introducing some new 15mm resin pieces, including some Civil War tents and accessories, including a log cabin. There will be a formal review in CHARGE! in the May hard copy issue. * Scale Creep Miniatures continues to shine with their excellent line of 15mm finely sculpted ACW figures. These are really, really nice. Pick some up today from your retailer. More vignettes are coming this year! * A new Brother Against Brother scenario book, My Brother’s Keeper, is in the works. A collaboration between Scott Mingus and rules author Ivor Janci, this is the first major new scenario book for this rules set. * Robert Sweeney has introduced an optional card-based system to augment Johnny Reb 3; details are in the May issue of CHARGE! What a blast to play! This adds uncertainty and a fog of war element to the miniatures game. * Upcoming new, original scenarios in the pages of CHARGE! include Fari Oaks, Seven Pines, Welkdon Railroad, Honey Hill, Fort Wagner, Monroe’s Crossroads, several battles around Atlanta, and much more. However, please keep sending in scenarios – we always have room for more!!! * Nothing new to report yet on Johnny Con 2007; perhaps this Civil War gaming convention was a one-year wonder? I hope not. I missed last year’s , and was looking forward to this one. Perhaps it will return later this year, or even next year???? 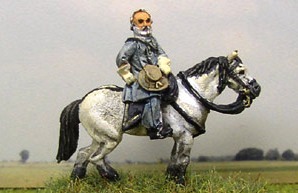 * Anyone want to buy a large ACW 15mm painted army:??? If so, please contact Scott Mingus. 550 figures plus 21 guns and 6 limbers. May consider breaking these into smaller units if no one wants the entire lot ($375 takes everything, plus houses and accessories). Buried treasure of the Gettysburg Campaign? On June 27, Rebel raiders under Lt. Col. Elijah White visited Hanover, a bustling railroad town in southwestern York County. They procured horses, food, liquor, supplies, and any thing else of interest, usually paying in worthless Confederate scrip. A number of merchants and shopkeepers had wisely taken their most valuable merchandise into hiding. However, some procrastinators were still in town when White’s men rode into the center square. Hanover jeweler William Boadenhamer, after a late start, was frantically leaving Hanover on theYork Road.. Gun-toting cavalrymen overtook his carriage about a mile from the town and stole a large box of retail goods. Resting in the shade of a tree near Samuel Mumma’s grist mill, the Rebels opened the chest and found to their delight that it contained nearly one hundred watches and jewelry. They distributed part of the loot among themselves, and, in nearby Jefferson, a soldier passed along a brooch to a little girl he encountered on the street. It is one of the few jewelry pieces known to have been recovered from the entire inventory Boadenhamer lost to the raiders. What happened to the rest? 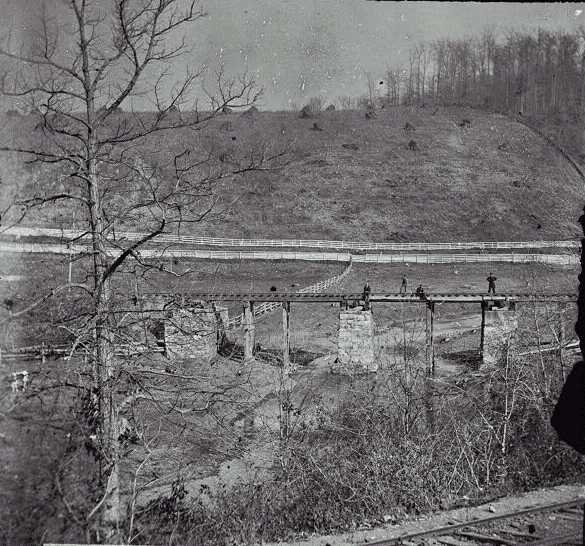 In a 1906 letter, Elijah White informed former fellow cavalry officer John S. Mosby that, on his way to sacking the railroad depot at Hanover Junction, “Nothing occurred on the way of any consequence, except I captured a wagon load of jewelry. After supplying ourselves, we buried the balance.” For many years, eager treasure hunters have vainly sought White’s buried treasure, if, indeed, he had truly ordered the bulk of an entire jewelry store’s inventory to be stuck in the ground somewhere in the vicinity of Mumma’s old mill along meandering Oil Creek. By the way, it’s private property today, so don’t trespass with those metal detectors!!! Here is an advance abstract from my new manuscript I am currently working on (Volume 2 of Human Interest Stories of the Gettysburg Campaign). This will be published by Colecraft Industries as a part of this continuing series of popular books. Confederate horsemen under Brig. Gen. Albert G. Jenkins, a former Democratic U.S. Congressman from the hill country of western Virginia, scouted the south-central Pennsylvania area. His troopers raided farms and homesteads for horses, livestock, and other items of interest to the mountaineers. 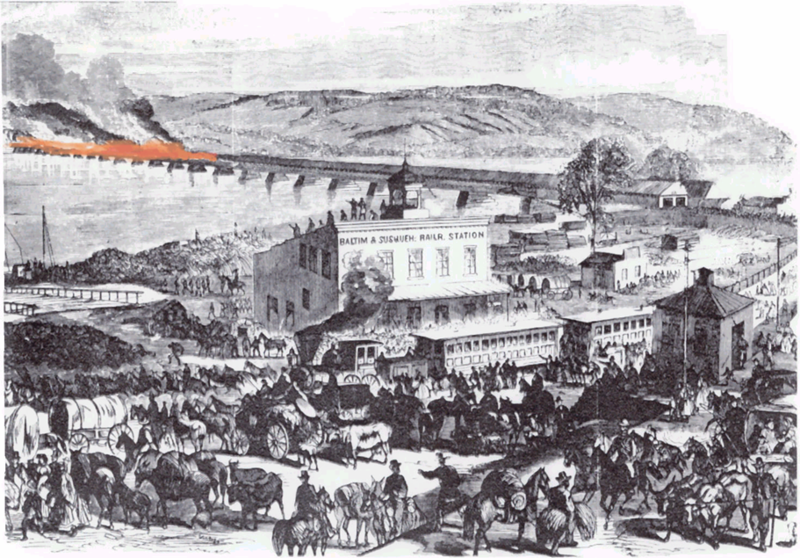 Jenkins departed Carlisle on Sunday, June 28, with some 250 soldiers and rode through Mechanicsburg towards northern York County, intent on raiding the prosperous town of Dillsburg. Near the hamlet of Williams Grove, his men spotted a large, brightly colored U.S. flag waving atop a nearby low mountain. Entering the village, Jenkins encountered a civilian named Lee Welty, who lied and calmly informed the Virginian that the impressive banner marked the vanguard of the oncoming Union Army. Jenkins temporarily halted his advance and splashed back across Yellow Breeches Creek to regroup. The fluttering flag was a deliberate ruse, having been planted on the mountaintop by some local boys. Dillsburg residents used this brief respite to hide their valuables and horses in nearby woods. Hotelkeepers stashed their liquor, and pharmacist George Shearer secreted his wooden barrel of “medicinal whiskey” in his barn. After General Jenkins finally figured out there no Yankees in the area, he occupied Dillsburg, but found little to procure except forage and food.